This is an account of the earliest known record of Cranberry Portage and the Grass River region. Copies of early maps are on display in the museum. One of these interesting maps is presented here. In 1806 Cha-Chay-Pay-Way-Ti drew the Grass River route from memory for the surveyor Peter Fidler. It is a document remarkable for the details with which the broad outlines of the Grass River system are displayed. It shows some of the trading posts which had been built in the area by 1806. Cranberry Portage linked the Grass River system with the Saskatchewan River system by way of the Sturgeon-Weir River and Goose Lake (Niskaw L. on the map). This route was important in the first period of inland trading by the Hudson's Bay Company before it fell out of use when York boats were introduced. Joseph Smith's account of 1763 shows the Hudson's Bay Company traders were completely ignorant of inland geography. 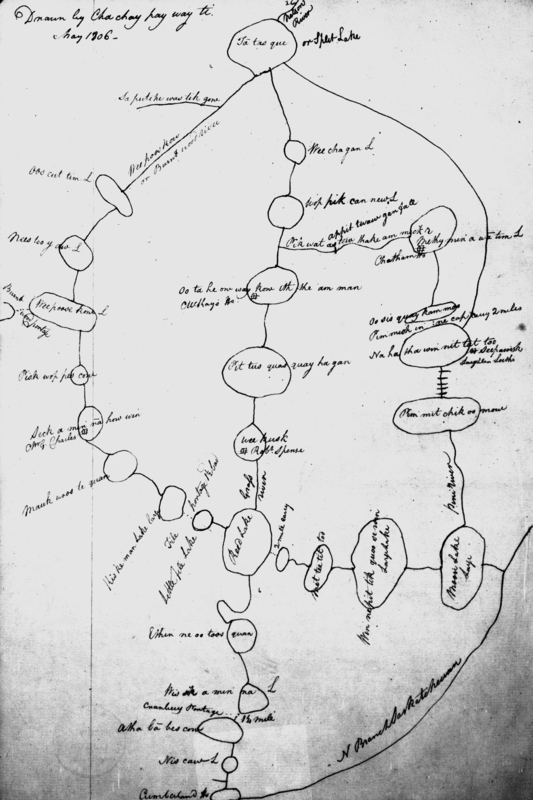 Cha-Chay-Pay-Way-Ti's map with Peter Fidler's notes in 1806 shows a much deeper understanding of the country by the traders, but also the continued dependence still on local Indigenous knowledge.